Greece has largely created its own economic crisis, and it's time for a reckoning. How did Greece get to this point? How did a once-proud nation get brought to its knees economically by its partner nations in Europe? Greece, a nation that stood up to the Persians, fended off the Turks for centuries and preserved its culture during occupation, fought and turned back the Italians during World War II (famously delaying the Nazi invasion of the Soviet Union to the winter, thus leading to Soviet defeat)—what happened? The root of the problems in Greece are broken promises made by politicians, and a populace which (understandably and unfortunately) accepted that the politicians’ promises would be kept. Unfortunately, the promise of full pensions with no cuts and no tax hikes simply could not be kept forever. If Social Security is the third-rail of American politics, pensions are the electric fence of Greek politics. Even the so-called “conservatives” in Greece (the party named Nea Dimokratia, or “New Democracy”) fearmonger over pension non-payment. Like many western nations, Greece has an aging population with more retired workers to support than workers currently working. Greece (in)famously has pensioners who retire at early ages and collect the pensions for years—both public-sector workers and private-sector workers. As The Economist points out, reforms (i.e., cuts) have not been made for current pensioners and others who were basically “grandfathered” in at pensions and benefits at levels prior to the economic crisis. This combined with the fact that Greece’s economy has a large public-sector component is lethal. What further complicates the Greek situation is the economy is dependent on tourism in a major way. Tourism generates approximately one-fifth of Greece’s gross domestic product, with services generating over 80 percent of Greek GDP. Shipping accounts for much of Greece’s GDP as well, and with such services being cyclical, as the economy slowed for other countries, Greece suffered as well and never really fully recovered. This combined with the fact that Greece’s economy has a large public-sector component is lethal. With 40 percent of the Greek GDP from public-sector sources, any public-sector cuts (so-called “austerity”) has a devastating affect on the economy. Normally, a nation suffering from economic slowdown will take measures to inflate its currency to stimulate its economy. Making a currency cheaper is one way to attract investment interest. The Federal Reserve did that here after the financial crisis through its various “quantitative easing” programs and by cutting short-term interest rates to near zero and holding them there for the better part of a decade. 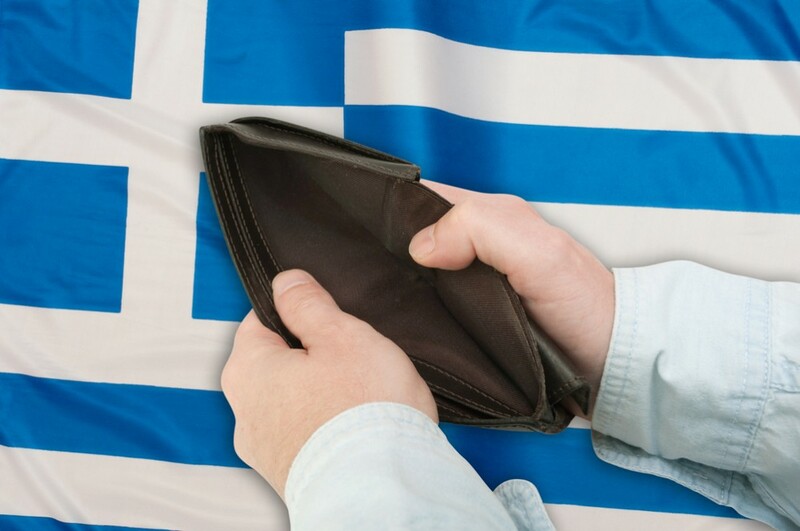 Greece traded its monetary independence for entrance to the European Union. Greece can’t do this, however. Greece traded its monetary independence for entrance to the European Union. This was a mistake. In fact, it also was based on lies, since Greece fudged its own finances to meet Eurozone goals to enter the common currency (thanks to @DrewMTips for reminding me of this). Greece’s monetary policy is essentially controlled by the European Central Bank. Greece has no control over interest rates. Greece cannot hike rates to combat inflation or cut them to stimulate the economy. Herein lies one of the problems with the Euro: the Eurozone’s needs are a balancing act and the Bank of Greece cannot change monetary policy to help stimulate the economy within its borders. Anecdotally, many people were talking about problems with the Euro from its onset. I was in Greece about one year before the adoption of the Euro. A price of something simple, like a bottle of water was approximately 100 drachmas, which was about $0.30. After adopting the Euro, prices skyrocketed. The same bottle of water cost over 1€. Folks in the tourism industry complained that Germans, French, Spaniards, etc. who brought Marks, Francs, and Pesetas to Greece and left them there only had Euros—and suddenly became more stingy with their spending. The Greek people voted “oxi” (pronounced “o-hee”, meaning “no”) on Sunday, rejecting the proposal by the European Union for further debt relief. Perhaps there will be more negotiations and an agreement involving tax cuts and spending cuts. Maybe Greece will be thrown out of the Euro. Maybe nothing will happen for a long while as the politicians continue to wrangle. But the bottom line is this: Greece is bankrupt and should be allowed to declare bankruptcy. People and countries go bankrupt. Government leaders break promises. Creditors who foolishly lent to an insolvent nation should deal with those repercussions. With every vote, a populace makes a choice. Greece made a choice today. It will deal with the consequences, as it has a right to do. Nikos Kazantzakis is quoted as saying “I hope for nothing. I fear nothing. I am free.” Here’s to hoping the Greek people regain their freedom. Mike Peters is an attorney from New York City. He draws inspiration from Heraclitus, Publius, and Johnny Ramone. Follow him on Twitter at @ThePantau.